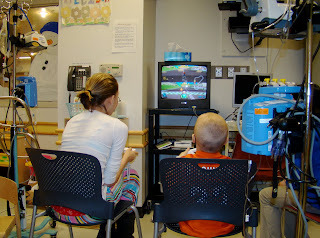 In Liz's first stay at Children's(some 30+ days)she was reluctant to leave her room. In part because she had limited strength, however there were many days that we would go on walks up in down the hallways on the 5th floor late into the evening. She did not like walking the halls during the daylight hours when everyone else was up and around. I believe this was in part due to the fact that Liz knew that outside the walls of her room were very sick kids that had been fighting cancer for a while. Their appearance was everything you would come to expect from a cancer patient: bald; pale; round faces; very thin. A lot of uncertainty about what the future holds. In short, it was all overwhelming for Liz to step outside her room. I don't think she felt like she was ready to take all that in...one step at a time RIGHT!!! Well, last night when I visited Liz at Children's about 5:30 she informed me that she had plans @ 6:00. You see most of the kids on A5 south are considerably younger than Liz. Liz as a teenager is in the minority. Liz went on to inform me that she had plans to watch High School Musical III with Leah, an 11 year old down the hall who is fighting her own battle with cancer. The clock struck six and Liz was on her feet, lines dangling from her port, rolling her meds along with her down the hall. She had a date to be kept! A while later Christine and I peeked in the room and what I saw was so much more than a couple of kids watching a movie.It sent shivers up my spine! I saw Liz sitting with a number younger kids, most bald, all sickly, all fighting the same fight. All with their meds hanging from posts, all sitting as close to each other as they could! Liz was loving them like a big sister loves on her baby sister. I can't imagine anything God would have rathered Liz be doing in that moment in time. She was supporting her young companions in a way that maybe no one else can. Ya see,cancer does not define who she is but Liz has absolutely found a way to use here circumstance for good in the lives of others! Praise God! On Thursday night, on A5 south, God was smiling!!! Oh, hospitals. You know Dave and I are right there with you. Love you, chica, and I'm SO proud of you. Glad to hear everything went so well this week and that you are home safely. Always praying for you! We are so glad that you are home and everything went well. I know you felt very sick during your hospital stay and yet you found a way to help others! You lift everyone up! I'll add to this post that you have no idea how happy you made Leah that night. I told you the other day how excited she was and how much she liked you, but I'm not sure you realize the extent of it. Her mom took the initiative to email to tell me all about it. I'm guessing those kids are looking up to you, and what they're seeing is such a great example of how a person should be. You made those little girls' night! I know everyone around you appreciates your sunny disposition and positive attitude. Thanks for being a great young lady. Hearing how you are blessing other children on your floor gave me the shivers as well, and I wasn't even there! What you did din't surprise me at all....you have the most wonderful spirit around you, and with all you have been dealt, I hope that you can make lifelong friendships with all of these people as you all conquer this battle! liz ! you have such a positive attitude and this story is just another example. Mrs G and i were talking about how you act like you never have a bad day and everything is always great. i dont know if i would be able to do that!! Im not sure if you can come but if you want to you should come to impact on wednesday night... let me know :) stay strong and keep depending on god and the people around you! if you ever need anything let me know ! ps. i made you some sweet notesss!! Thanks for sharing this story, and Lizzie, thanks for sharing yourself with others you continue to be an inspiration to all!